At the Glastonbury Festival in Somerset, England this weekend, rapper Kanye West performed his own version of Bohemian Rhapsody, the iconic rock anthem by Queen. 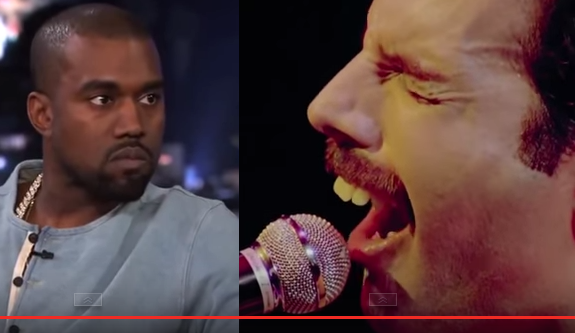 And in Freddie Mercury fashion, West encouraged the crowd to participate in singing the song. The Glastonbury crowd seemed to have been more than happy to oblige. They can be heard breaking out into a song whenever West pointed the microphone at them. However, a lot of people wasn't too happy about West's version of the classic song. They point out that West tried to cover up his inability to hit the song's high notes by transferring the mic to the crowd whenever he reaches the high-note portions of the song. A radio station in New York went the extra mile by pitting West's rendition to a live performance by Mercury himself.